The Chief Commercial Officer of the Netherlands-based DSM Engineering Plastics, which has a plant at MIDC, Ranjangaon, near Pune, speaks to Autocar Professional on the burgeoning demand for high-performance engineering thermoplastics as a result of OEMs’ need to slash vehicle weight, why Tier 1 suppliers from India are keen on exploring innovations and new materials, and also why India and China with their huge two-wheeler industry are the markets to be in. How has the development of new materials for automotive applications evolved over the years at DSM Engineering globally? We are a science company. It has been a heritage for our company to continue to innovate on new materials to bring to the market, with the idea being relevant particularly in the automotive and electronics industries. In the case of engineering plastics for the automotive business, we first developed that position in Europe, multiplied that in the US. In more recent years, which has been a very dynamic period, we have been growing our businesses here in Asia. In this period, we have been able to build upon some science developed from the past. But there also has been the need to develop even newer and different materials to fully complement our portfolio of thermoplastics, which have a wide array of applications in the automotive and electronics domains. We think that we are well positioned, as leaders globally, to help support the needs of the automotive industry. In particular, you have trends that are taking place with respect to the eventual decline of the use of the internal combustion engine. That is not something that is going to happen overnight. We still have a great dependency as a culture to rely on fossil fuels to be able to power us to go from point A to point B. Yes, there is a lot of pressure on the existing technologies to be able to improve the efficiencies and reduce the emissions from fossil fuel-based technologies. So in our development of materials, it is very much of interest to be able to lightweight wherever possible. 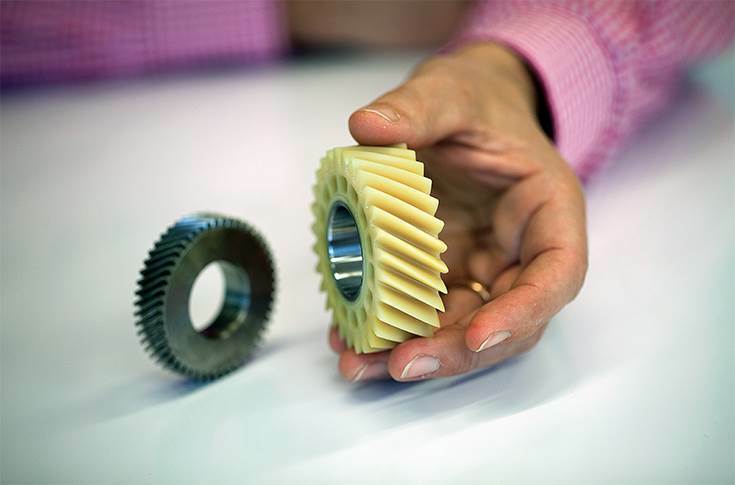 The challenge is to be able to find the materials that are also capable of doing what metal parts could do whether it’s strength, wear resistance or temperature resistance. It is just not easy to go from metals to plastics. 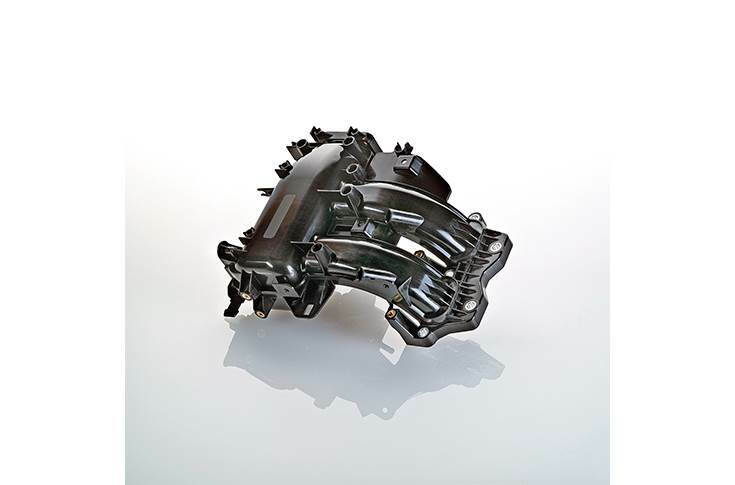 It is really dependent upon the physical attributes – we have been investing upon those in the past and have been involved for the past 30 years in transmission and under-the-hood components and have a lot of interesting materials. Now, there is a lot of talk about electrification and being able to become more environment-friendly. Is it a problem for engineering thermoplastics because our traditional markets where we have been successful will certainly decline over time? Nonetheless, we are quite bullish about the opportunities. DSM's Stanyl PA46 solution can help make automotive gear for motor management, engine and transmission. Stanyl offers benefits of upto 40 percent cost reduction, upto 45 percent weight reduction and more durability when compared to its metal counterpart. There is actually large demand of thermoplastics because those vehicles will have the same challenges as far as lightweighting but also a lot of technological issues that will require more electronics (which further deploy thermoplastics). Therefore, we see an increase in terms of the amount of the thermoplastics required in vehicles. Generally, worldwide, you have about US$ 3,500 worth of plastics components in a traditional internal combustion vehicle. The estimates are that it could be as high as three times of that in order to deal with all of the thermoplastic needs of the future. What is the contribution of the automotive industry in DSM’s overall business worldwide? 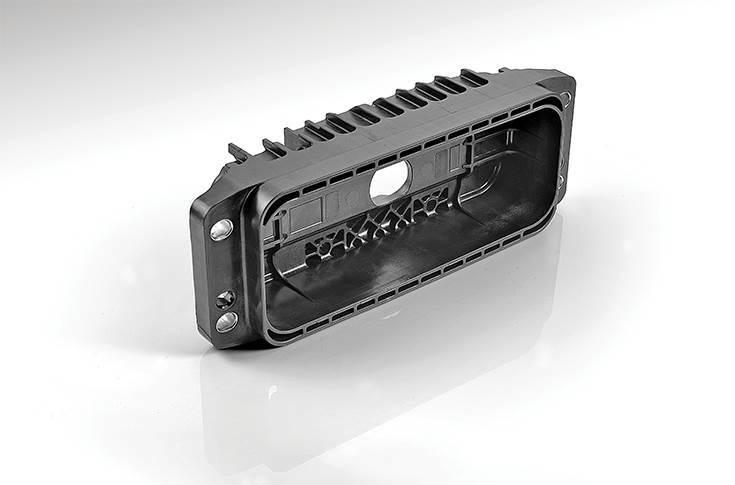 We have two primary markets that we are serving with our engineering thermoplastics – automotive and electronics. Of our overall business, approximately two-thirds is in these areas (for materials). It is very material to our business, to our profitability and to our agenda for developing products. DSM is a large chemical conglomerate. We have two basic pillars to the company related to health and nutrition and materials. In the material science component, we represent the engineering plastics part of the business. We also have a resins division, and automotive is a significant component of the resins group as well. 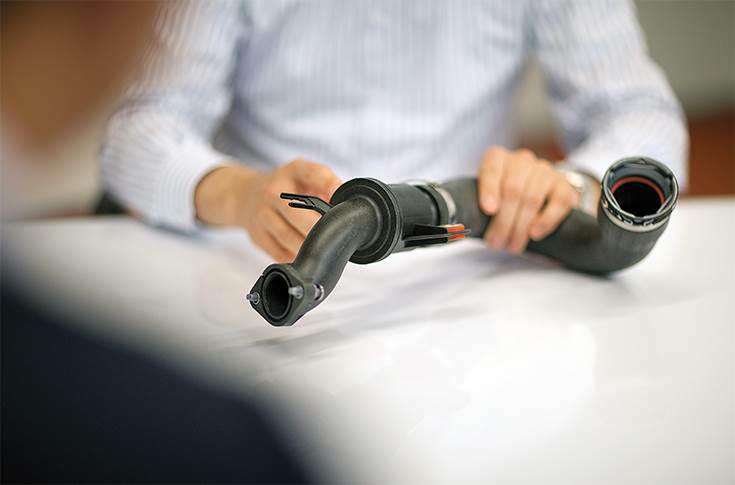 How are the auto-specific innovations on the front of the bio-based EcoPaxx shaping up at DSM Engineering? EcoPaxx is a combination of using oil-based raw materials in conjunction with natural gas to be able to develop a more sustainable feedstock for high-temperature performing materials. This year, we have been getting more and more interest from customers to be able to develop (this material). Where we have seen the strongest push is electronics. There is a great deal of interest in automotive but at the end of the day the competitive nature of the automotive (industry) and the scale that is necessary to be able to have a truly green solution has always been a challenge. There are traditional ways that we have looked at in terms of recycled content. We are very active in India on being able to look at recycled content as a product offering to help reduce the carbon footprint and the environmental impact here. That has actually been quite an interesting point for the Indian marketplace to try and be more proactive in that regard. Coming back to EcoPaxx, we see that the greatest impact has been in the electronics for applications that are more directly servicing customers with respect to consumer durables like cellphones. Also, things like the public is becoming much more aware of finding solutions that are environmentally friendly. So, while you would expect that to come from automotive, I think where it goes is first in stages. You see the general trend away from internal combustion engines into electrification of cars, that’s creating the first wave. That is what you as a consumer understand and recognise. How you get there is not so important. You want to buy a vehicle that is able to drive a longer distance using less fuel, whether that is to save money or to protect the environment. How we solve that is to be able to enable that with at least thermoplastic technology with high-performing materials that can help achieve those goals. We are able to use 100 percent bio-content in thermoplastics, and we have projects that are able to locate how to prepare for that in the future. It’s difficult because the primary driver here from automotive design engineers is how to address their customers’ needs and wants. The fact is that our 100 percent bio-content is nice for them but they are also trying to address the big problem of how do we get the fuel emissions down, how do we lightweight the car for better fuel efficiency, how do we get into electric cars. to be relevant with customers. In the end, we are going to be positioned for it and we are also depending upon the end user and what they are willing to buy. Don’t you see enough participation from your direct and indirect customers, component suppliers and vehicle manufacturers, in terms of engaging more on the front of the biodegradable materials like EcoPaxx? In some cases, yes, the companies can be very supportive. It also is an area which can be very difficult depending upon the component. Some of the raw materials that we utilise come directly from oil. The big oil companies also realise that they cannot ignore what is going on and (they are) looking for ways to be more efficient in their own footprint. But it is a very difficult challenge for them. You also have other areas where there may be more environment- friendly solutions; then the question becomes – scale. Companies like ours are able to take the initiative and invest in those type of materials where our suppliers either have an adverse interest or they don’t have the scale to be able to get us where we need to be. In that sense, it is important for companies like ourselves that we take a leadership position and we go as far as we can as long as the customers let us. 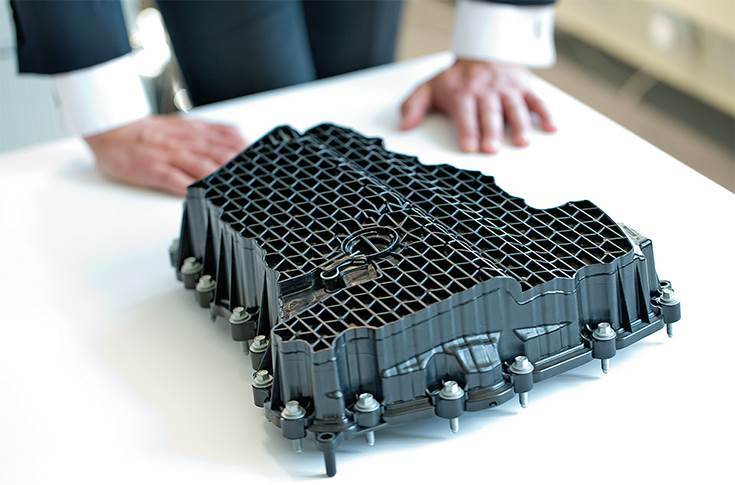 While the automotive industry is exploring alternate materials to reduce vehicle weight across the spectrum, according to an estimate, OEMs globally are looking to cut up to 200kg from overall vehicle weight in the foreseeable future. How does DSM Engineering process that? Is there any pressure or urgency from the industry to do so? I don’t feel so much of pressure because these are the solutions that actually we have had for some time. We have innovated in the past and we continue to innovate with materials like ForTii, anticipating the trends that have been not only something that we have seen from the legislative standpoint, which is creating pressure for the automotive companies to respond to, but also the (demands from) customer base. At the end of the day, you have a different mindset within the millennials where there is much more of an interest in being able to think about the long-term future of the environment and that pressure is being pushed back onto the automotive customers. In our case, the pressure that we have, if any, is that we want to be able to engage with automotive engineers, that our solutions are going to be economically viable and that it will also help them to meet the requirements of not only the legislative groups but also meet the demands of the customers to be far more green. We actually feel quite good about that part. We have one of the most diverse portfolios for high-temperature thermoplastics, we have that proven track record for several decades in this space, and we have a global network that allows us to be able to translate design considerations and our existing customer base that we can pull into to be able to meet the upcoming automotive leads. As I said earlier, we are well positioned and we can go as fast and slow as the automotive industry. Given these automotive megatrends, would it be correct to assume that DSM Engineering is more aggressive than ever before? Do give an Indian perspective on this. In the Indian context, we are beginning to see that Indian OEMs are now asking suppliers to submit estimates and plans on achieving the weight reduction on certain components. So we do see that pressure trickling down to the Tier 1 suppliers. I see that because we have already received a couple of requests from them (Tier 1 suppliers) – one in suspension systems, and another in the wheel rims – on how to further reduce the weight in those areas. They appear to have already exhausted all the methods like thin walling and others, which you could do with your existing materials to cut down the weight. Once you exhaust the conventional methods of cutting down the weight, you start looking at the alternate materials. So yes, I think we are seeing that pressure on Tier 1 suppliers as the OEMs are indeed pushing that through. In some cases, I see that the first preference for the Tier 1 suppliers is to basically explore if there is a certain technology that is already implemented in Europe or the USA. Having said that, of late I am also seeing some interest in the Tier 1 suppliers to explore absolutely new innovative and new materials to achieve weight reduction. We are seeing that trend in India too. However, I would also like to add that one of the bottlenecks that the industry has in India is that it is so competitive that innovation really does not last long unless it also brings down the costs. For example, if there is an innovative (product) design, it won’t be accepted well by the OEMs unless it cuts down the costs as well. I believe that mindset has to change, given the changes happening in the automotive industry. Lightweighting is going to be one of the biggest requirements in the development of electric vehicles. So, definitely, the industry is catching up and this (weight reduction) is a topic that is going around everywhere. I see for the next couple of months strong pressure on the value chain given that the Tier 1 suppliers are already working towards given deadlines. If we start working on new projects, they will be on the road by 2020 and onwards. So I think the stage is set and we should see more enquiries this year. Would you agree that the BS VI emission mandate is one of the biggest drivers in the Indian auto industry today that is pushing for vehicle weight reduction? Yes, I do think that BS VI is one of the biggest drivers for the industry to sort of push for lightweight materials. India is poised to become one of the top three passenger car markets in the world. It already has a very prominent place in commercial vehicles and two-wheelers. How does the global management at DSM Engineering view India and the opportunities associated with it? We see a tremendous opportunity in Asia including India, where probably the biggest drive, more than what we have discussed in respect to the emission standards, is the experience of getting from point A to point B. Who is going to lead in those kinds of activities? There are a number of issues that come in terms of safety, autonomous driving technologies and connectivity within the vehicle. We see the fastest emerging areas for this disruptive change taking place in Asia, particularly in China. We have been investigating quite a lot in the topics of swarm innovation. This is the idea where you have new companies that are emerging and are having a disruptive effect in terms of bringing new technologies into the traditional marketplaces, and we see that having a huge impact in the automotive space. There are new companies that are working to leverage global design activities. Nio is an example of one company in China where it didn’t even exist until a couple of years ago and they are involved in this new space (cryptocurrency). Does that mean that an old company like GM needs to worry about closing shop? I think there is a lot of critical mess with a company like that but they do really care. Therefore, there are traditional business models that are getting challenged by the advent of many players that are coming into the same space in Asia for, if nothing else, there is the sheer opportunity that there is more disposable income. 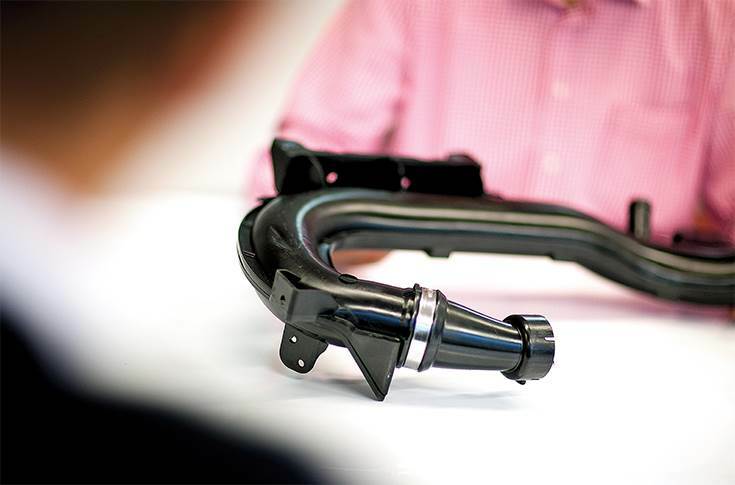 People want to be able to have a new experience and that new experience isn’t just about driving, it is about getting from point A to point B.
DSM's Stanyl and Arnitel help make lightweight air ducts. With Stanyl, they are lighter compared to metal or PPS and can handle up to 230deg. Arnitel grades replace rubber, cut weight by 50 percent and work under prolonged temperatures of upto 140 degrees. are going to be worried more about the creature comforts like, do I have an adequate place to sleep in the vehicle, do I have my kitchen or my living room in there. As a result, the designs that are taking place and the connectivity that you want to experience are all going to be driven by a highly demanding generation which has grown up on nothing but the internet. So that factor creates a huge opportunity. There are barriers that I think in Asia will be much lower. The design of a vehicle traditionally takes at least 18 months. I think that threshold can be challenged if we see what it is taking place in terms of leveraging design innovations. The breakthroughs in automobiles are designed in lesser time to get them from concept to market. The companies that will be able to do that will gain space and that will happen in Asia. In India, I think the question is whether or not that applies to the automotive industry, certainly, there is a parallel with the two-wheeler market. This is a very substantial two-wheeler market, and traditionally you have seen this area served by foreign suppliers. But recently we see the emergence of very large players that are domestic. Now in the short term, you are basically taking similar technologies (from the developed markets) and domesticating them. But as you work to try and improve the experience, how you deal with the emissions and all the other things that are improving the quality of that experience, for sure that’s going to be driven by the domestic Indian companies and the partners that they make in the region. So how do we view this as a material supplier? These trends are multiplying across the globe at a faster rate than ever. The disposable income that is available to improve the quality of the experience will increase, maybe on a different scale but for sure everything is moving towards higher quality. If you have over half of the world’s population concentrated in India and China, for sure it will have a major impact in terms of where we want our innovations to follow. In our case, our portfolio addresses a number of these issues. The struggle is to try and figure out which companies are is going to try and take advantage of their positions to address these issues. But it all comes down to having a proven track record, the portfolio of materials and the commitment to continue to invest in innovations for new materials. We are ready to be able to go as fast as the market is.